Prisoners (2013) - Where Are Our Daughters? Do You Like Crime Thrillers? Try "Prisoners"
The fall seems to be a good time for films about demons and mass murderers. Perhaps it is the whole association of autumn with Halloween and ghosts and ghoblins. 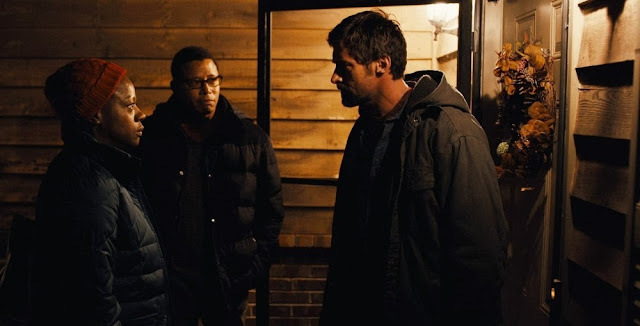 "Prisoners" (2013), a Alcon Entertainment film ("The Sisterhood of the Travelling Pants") directed by Denis Villeneuve and written by Aaron Guzikowski, embraces that imagery and adds to it. While not a classic horror film like the ones that have captivated audiences during recent Halloween season such as "Sinister," "Insidious," and "Insidious: Chapter 2," "Prisoners" creates its own horrors by revealing how dastardly people can become when pushed far enough. Hugh Jackman is troubled and takes matters into his own hands in "Prisoners." It is Thanksgiving, and Keller Dover and his family are spending it with their neighbors, the Birches. Both families have 6-year-old daughters, Anna Dover and Joy Birch, along with other children. Anna and Joy are playful and, during a walk outside before dinner, horse around on someone's nearby parked RV. After dinner, the two young girls leave to go to Anna's nearby house, but they never make it there and disappear. 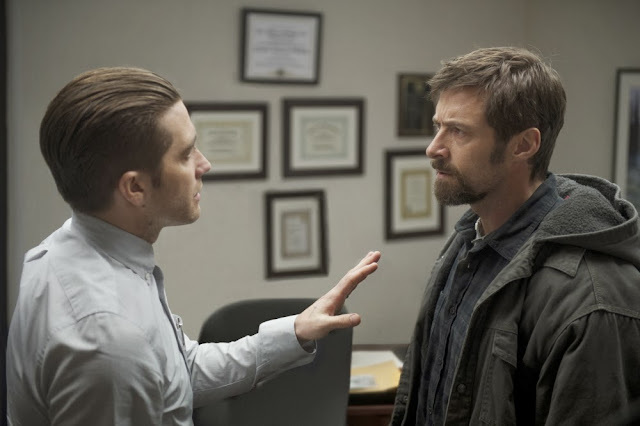 Jake Gyllenhaal is pitch-perfect as Loki in "Prisoners." The families call the police, and the RV the two girls were climbing on earlier is found at a gas station which is located near a heavily forested area. The police detective, Loki, questions the driver, Alex Jones, who speeds away in a frenzy and crashes. Taken for questioning, Alex turns out to be quiet and child-like. There is no evidence that he ever knew the two girls, let alone kidnapped them. Loki, however, remains suspicious. He visits Alex's aunt, Holly, who served as Alex's parent after his parents died many years earlier. Alex, now that he is grown, essentially lives in the RV. A loving family on Thanksgiving in "Prisoners." Alex is held for two days, then released. Keller still thinks that Alex took the children, and confronts and attacks Alex in a parking lot. Keller claims that Alex confessed, but nobody else heard Alex. Keller returns to Alex's RV and kidnaps him at gunpoint, confining him in a run-down apartment building that he is renovating. He and Joy's father, Franklin Birch, torture Alex in order to extract information on the girls' whereabouts. Franklin eventually tells his wife, Nancy Birch, and she comes to see Alex. Nancy frees Alex, but Keller recaptures him and imprisons Alex in a more secure spot inside a shower. Now, Keller is free to torture Alex with things like scalding water without fear that Alex can ever escape. The Birch family is heartbroken in "Prisoners." Loki, meanwhile, has heard that Alex is missing. He suspects that Keller might have something to do with Alex's disappearance, and so begins following Keller. The Birches by this point have had enough, but they don't turn Keller in. Loki pursues other leads, and one of them is a Priest, Father Dunn, who is found to have a dead body in his basement. Dunn quickly confesses that he lured the man to his house and killed him after the man said that he killed sixteen children. This, however, still does not solve the case of the two missing girls. "Let the police handle this." At a vigil for the Anna and Joy, Loki notices a man acting suspiciously and chases after him. The man eludes Loki, but is seen to break into the Dover and Birch homes for some unknown reason. Loki produces a sketch of the new suspect, and a store clerk recognizes it as a man who occasionally comes in to look at childrens' mannequins and then buy kids' clothing. The clerk is able to provide information to find the man, whose name is Bob Taylor. Loki goes to Taylor's home, which is found to contain numerous wall drawings of mazes. His home also contains locked boxes full of strange paraphernalia such as snakes and bloody children's clothing. The Dovers and Birches recognize some of Anna's and Joy's clothing, which results in Taylor confessing to killing them. "Tell me where my daughter is!" Keller now has to figure out what to do with Alex. He still thinks that Alex may have had something to do with the children's disappearance and death. When Alex, still imprisoned, mentions something about a "maze," Keller returns to the home of Alex's aunt to see if she has any reaction his mentioning a maze. Loki now tries to extract more information about the children from Taylor, beating him, but Taylor manages to commit suicide using Loki's gun. Further investigation reveals that Taylor in fact took clothing from the children's houses, not the clothing that they were wearing, and the blood on the clothing in his house is from an animal, not the children. Taylor, in fact, was just a poser who was acting out scenes from a book. Several days pass by, and Joy Birch passes out from drug abuse and is hospitalized. In a daze, Joy states in confused fashion that Keller was involved in her condition. Loki tries to capture Keller, who eludes him. Searching for Keller, Loki goes back to the apartment complex that he found out about when tracking Keller earlier, and there he finds Alex. Keller himself heads to Holly's house, where she detains him with a gun and forces him to imbibe sedatives. Holly now reveals that she had once been religious, but when her own son died of cancer, she and her husband had decided to wreak vengeance on other children, kidnap them, and turn them into demons. 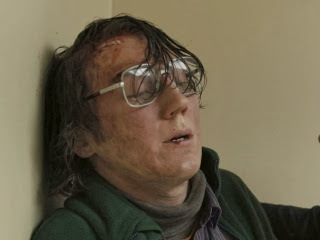 Paul Dano won't get much recognition in the press for his work in "Prisoners" - so he will here. Nice job. Alex, it turns out, was simply one of their early victims who they kidnapped. Holly's husband had run away recently, and that was the dead man found in Father Dunn's basement. Alex had given the two girls a ride for fun to Holly's house, and there she had kidnapped the girls. Hugh Jackman conveys the turmoil of a complex character in "Prisoners." Holly handcuffs Keller and throws him into a pit hidden under a car. There, he finds his daughter's whistle. Loki, meanwhile, visits Holly to tell her about finding Alex. When she doesn't answer the door, he enters and begins figuring everything out. Holly poisons Anna, but Loki breaks in just in time and kills Holly, saving Anna. Keller remains trapped in the pit for several days. Loki, though, is determined to find him for mistreating Alex. Loki digs up Holly's yard looking for past victims. Keller, hearing the commotion, frantically blows his daughter's whistle, which Loki hears. 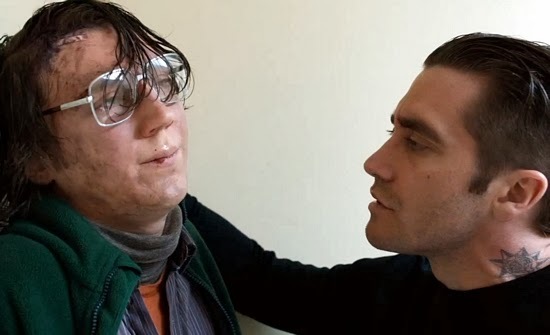 Paul Dano suffered for his role in "Prisoners." 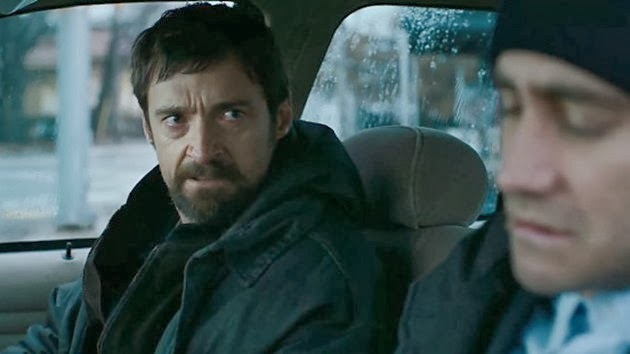 To say that "Prisoners" has a complicated plot for a standard crime thriller is a gross understatement. There are twists and turns throughout, with everyone interconnected in those coincidental ways that tend to happen only in really good fiction. 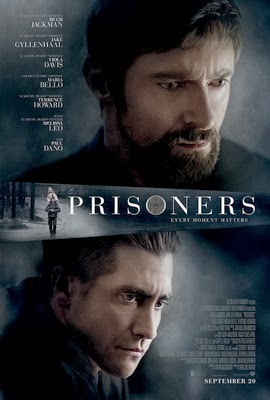 Watching "Prisoners" is like reading a good Agatha Christie novel, where everything leads to something else, but even after things seemingly are wrapped up, more suspense awaits. 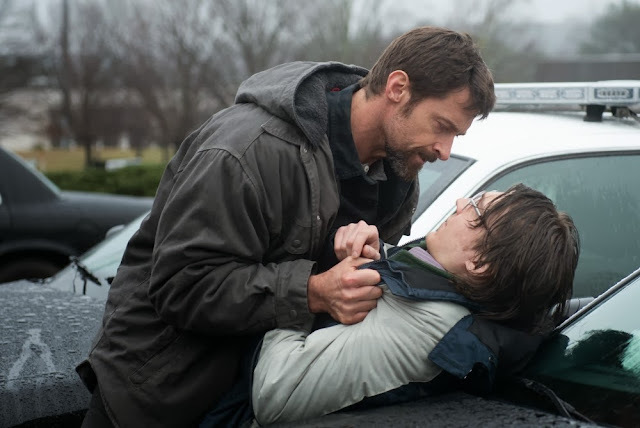 "Prisoners" isn't meant to be particularly realistic, with all sorts of interrelationships and people acting in ways that ordinary humans simply don't (Keller and Birch confining Alex is one of the bigger stretches). However, the intricate plot will keep you spellbound as long as you don't leave to get a soda or something and missing a vital lead that will become necessary to understanding everything later - if you notice it in the first place. Maria Bello at the premiere of "Prisoners." The acting is top-notch. 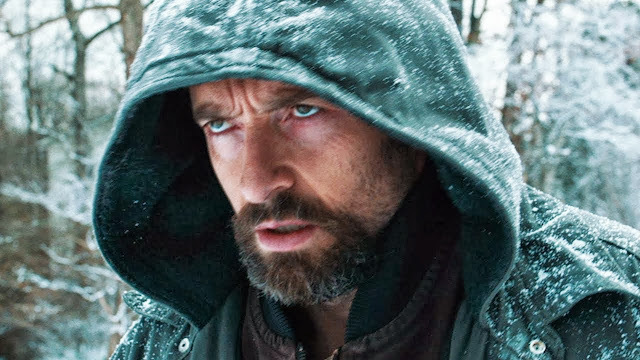 Hugh Jackman nicely plays Keller Dover as an obsessed man on the edge, while Jake Gyllenhaal is appropriately diligent as Loki. 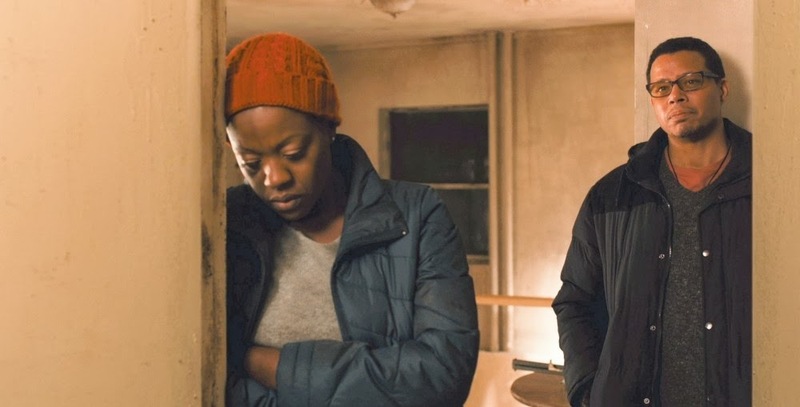 Viola Davis as Nancy Birch, Maria Bello as Grace Dover, Terence Howard as Franklin Birch, Melissa Leo as Holly Jones, Paul Dano as Alex Jones, and Len Cariou as Father Dunn all display the proper elements of alternating normality and creepiness that seems to infest every character. The best word to describe "Prisoners" is disturbing. It takes normal people and shows what even the steadiest personalities might be capable of when put under enough stress. If you enjoy complex crime thrillers, "Prisoners" should give you a fine evening's entertainment. 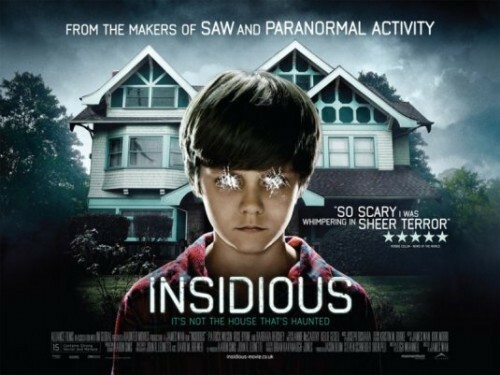 "Insidious" was the surprise Hollywood hit of 2011, being called the most profitable film of that year. Thus, it was no surprise that producer Jason Blum of Blumhouse Productions, IM Global and the other financial backers of the original film wanted to continue the story of the original film, which was left open in classic cliffhanger fashion. 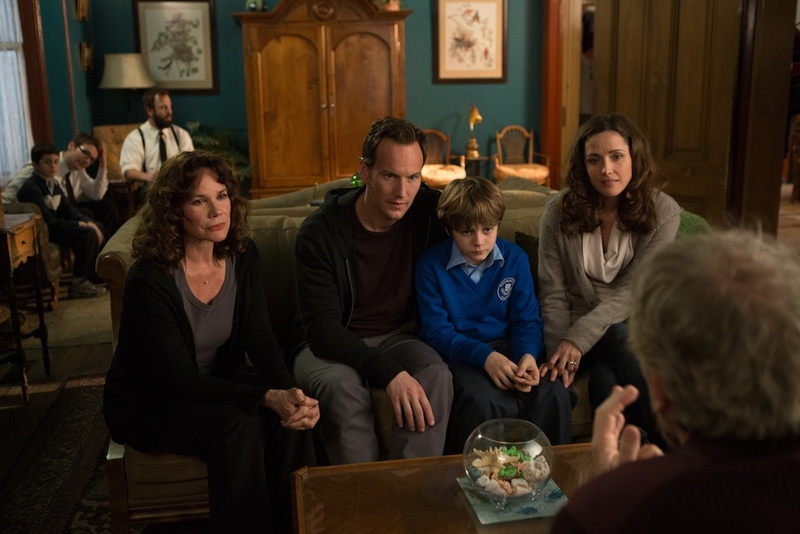 They succeeded in bringing back director James Wan for "Insidious: Chapter 2" (2013), another look at the dark, mysterious happenings to the Lambert family, along the original cast: Patrick Wilson as father Josh, Rose Byrne as mother Renai, Ty Simpkins as haunted son Dalton, Lin Shaye as friend, Elise, and Barbara Hershey as Josh's mother Lorraine. 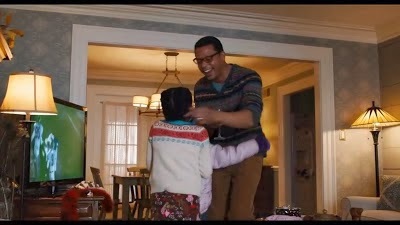 Wan is a hot director, his "The Conjuring" (2013) being very well regarded, but he put a lot of himself into this sequel, and that attention shows in its high quality. Patrick Wilson as Josh comforts Dalton (Ty Simpkins) in "Insidious: Chapter 2." "Insidious: Chapter 2" begins in flashback mode. Josh is a young boy, and his mother, Lorraine (young Lorraine played by Jocelin Donahue), is concerned because he is acting strangely. A medium, Carl (Hank Harris, later Steve Coulter), calls upon occult specialist Elise (Lindsay Seim plays young Elise) to help cure Josh. Elise discovers that an old woman has been appearing in photographs taken of Josh, and she tries to locate this mysterious character. Elise is led to Josh's closet, where she is scratched by something, and after that, everyone decides the best thing to do is just move on as if nothing had happened. Jocelin Donahue as young Lorraine in "Insidious: Chapter 2." The scene flips to the present day. The police question Renai about Elise's death (killed by the demon inhabiting Josh in the first film). The family moves to Lorraine's house, but Renai starts seeing strange things at night again. She suspects that Josh, who has not been arrested for Elise's death, may still be haunted by the demon, but he acts normally and tells her not to worry. Elise and her team in "Insidious: Chapter 2." When she gets up the next morning, Renai sees a stranger in the living room, a woman wearing a white dress. The woman attacks her and knocks her unconscious. Lorraine, meanwhile, visits Elise's team of occult specialists (Specs, played by Leigh Whannell, and Tucker, played by Angus Sampson). They visit Carl, who holds a seance to contact the deceased Elise. The seance gives them a lead, a certain hospital where Lorraine once worked. Lorraine discloses that when she had worked there, a patient named Parker Crane had castrated himself, then jumped off the roof of the hospital to his death. Investigating Crane's house, the team finds several odd newspaper clippings about a cross-dressing killer, along with related paraphernalia that strongly suggests that Crane was the killer, known as "The Dark Bride." The team also learns that Carl actually contacted Crane's own mother through the seance and not Elise. The Lamberts communicating with the dead in "Insidious: Chapter 2." Josh tends to Renai, who recovers, but Lorraine returns home and insists that everyone get away from Josh because she believes he remains possessed by a demon. The real Josh, she says, is trapped in The Further, the realm of the demons. They leave, and Carl and Elise's team then arrive to subdue Josh. Unfortunately, Josh figures out what they are up to and stops them. Returning home, Lorraine is locked in a closet by Josh, while he attempts to kill Renai. Dalton arrives home just in the nick of time and knocks Josh with a baseball bat. They flee for safety to the basement, but they know they can't keep Josh out forever. Dalton decides the only way left is for him to go to sleep and return to The Further in order to find the real Josh and bring him back. Carl has a similar idea. He ventures into The Further and finds the real Josh. Together, they search for Elise, and they find her at the Lambert's old home. Their next stop is Parker's house, where they find him and uncover his secret. When Parker had been a boy, his mother had abused him because she wanted a girl. Parker's mother is nearby, and she disrupts the meeting. Josh attacks her, and he almost is killed by her, but Elise arrives and saves him, knocking out Parker's mother. Carl, Josh and Elise flee, finding Dalton. The three living people then return to their world, leaving Elise behind. Josh in the real world is no longer possessed. Carl decides that they have been through too much trauma and hypnotizes them to forget their ability to astral project (go to The Further). The film ends with Elise's team investigating another spooky haunting, this time of a young girl. The makeup crew did a great job in "Insidious: Chapter 2"
"Insidious: Chapter 2" is a worthy heir to the original "Insidious." It feels like a real continuation of the original story, and was written by the same screenwriter, Leigh Whannell (who plays Specs). It is easy to be critical of sequels, because we all at least subconsciously feel as if we know what should happen next or what is believable as a follow-up, but the filmmakers wisely extended and broadened the story of "Insidious" rather than simply repeating it. "Insidious: Chapter 2" retains the low-budget creepiness of the original rather than substituting money earned from the original for imagination, and it works beautifully. You have the same sorts of scares from the first film and the same sense of foreboding. You also can read some symbolism into story, giving it depth: there is a recurring motif of closets and people being put into them, which underscores how the problems with Josh that were originally swept under the rug or put, so to speak, into a closet only returned later with a vengeance. 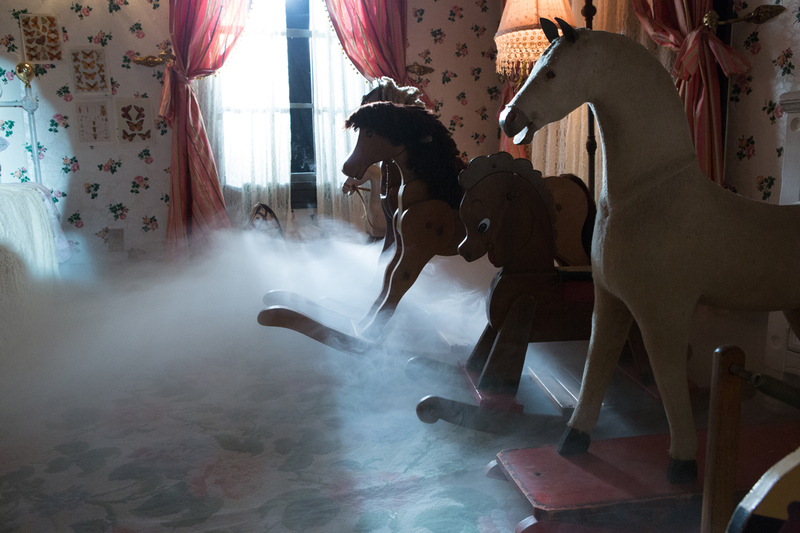 At times, the special effects get out of control in "Insidious: Chapter 2." There are some creative problems with "Insidious: Chapter 2", however. The whole idea of The Further is extended to the breaking point in the sequel. Rather than remaining some spooky and exotic place, by the end it becomes just another place where the characters go at will and do pretty much whatever they want in order to tie up loose ends. The creatures (the dead from all time - think about the real implications of that) in the Further wind up looking more pathetic than truly dangerous. Rather than taking over the living characters and acting upon them, the living in "Insidious: Chapter 2" turn the tables and instead act upon the inhabitants of The Further." That may be satisfying in terms of solving matters, but it also disrupts the entire chemistry from the original of innocent people desperately fighting for their lives against dark, mysterious, unconquerable forces. It becomes more a classic case of the living investigating a new but not particularly mysterious phenomenon, just as you would expect in real life, which is a lot less interesting than mysterious demons coming from some unknown place. The enemies in "Insidious: Chapter 2" wind up being simply weird people who suffer from prosaic problems, but just so happen to be dead - which doesn't matter, since the dead and the living turn out to be not very different at all anyway. 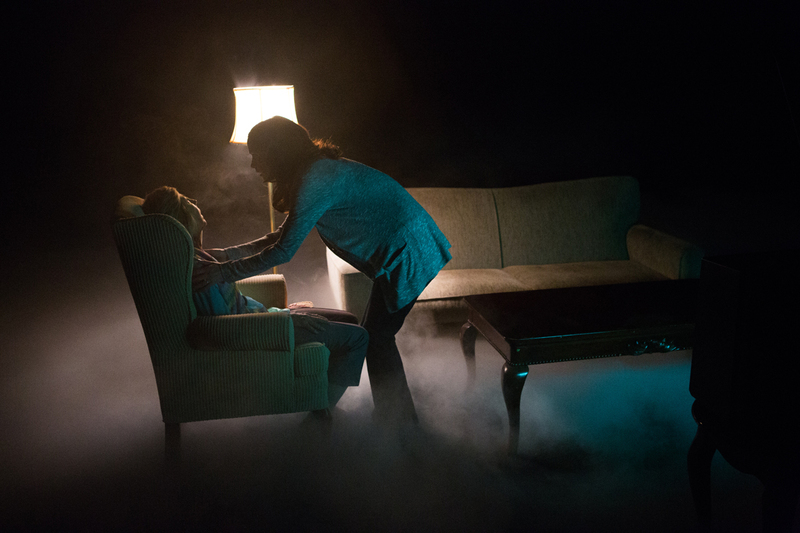 The spooky atmosphere is the real star of "Insidious: Chapter 2." To like and fully appreciate "Insidious: Chapter 2," you really do have to first watch "Insidious." Otherwise, all the references to The Further won't make much sense, nor will Dalton's sudden ability to go there. In fact, just to get specific about one thing as an example, one has to wonder why they go to all the trouble of having Dalton able to visit The Further at will (where did that come from?) when Carl already is there - it makes the whole idea of The Further a little less mysterious. In general, all sorts of horror film conventions once again are followed, such as the unbelievable notion that the characters would simply move on from the extremely traumatic denouement of "Insidious" without anyone being arrested or the arcs of the characters being interrupted at all. The impossible and indeed truly startling in its implications - communicating with the dead, let alone visiting them - is treated as some everyday occurrence with no ramifications beyond the characters and their immediate problems. The wrap-up to "Insidious: Chapter 2" is more of a let-down than a climax, which some will see as a similarity to the first film. Knock someone out and then run away - not very mysterious. Overall, the script is imaginative in places, but also a bit messy and formulaic in others. It could have used a few more drafts, to be honest. 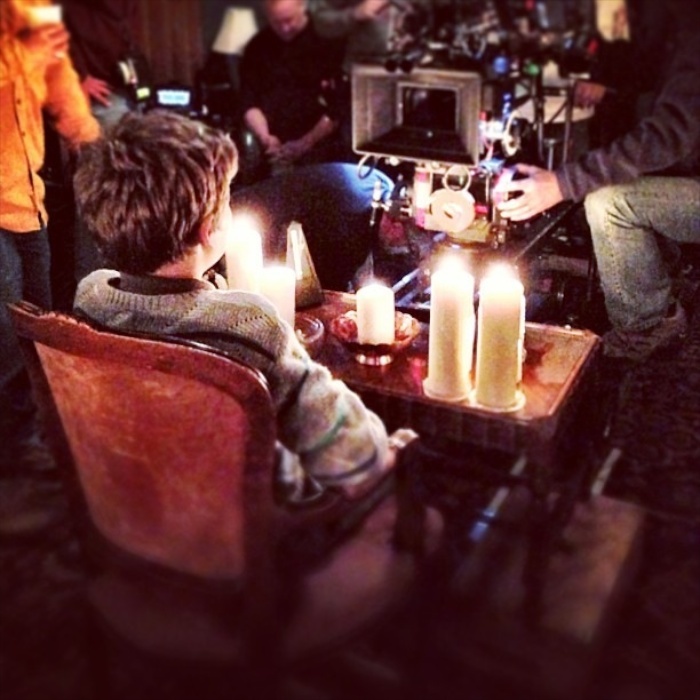 Behind the scenes in "Insidious: Chapter 2." All quibbles aside, audiences loved "Insidious: Chapter 2." It won the box office race during its opening weekend and turned into another cash cow for the producers. With all that money floating around, another sequel might turn up at some point, though it appears that the story of the Lamberts has been pretty much decided. A continuation would likely follow Elise's team of spook hunters investigating and resolving another case, as strongly implied by the ending of "Insidious: Chapter 2." Anyone who has seen the first film should consider watching this worthy follow-up, and anyone considering seeing "Insidious: Chapter 2" most definitely should see "Insidious" first. Insidious: Chapter 2 (2013) - More Spooky Fun! Rose Byrne in "Insidious: Chapter 2"
"Insidious: Chapter 2" opened on September 13, 2013. Once again, the Lambert family is terrorized by dark demons who lurk around every corner. 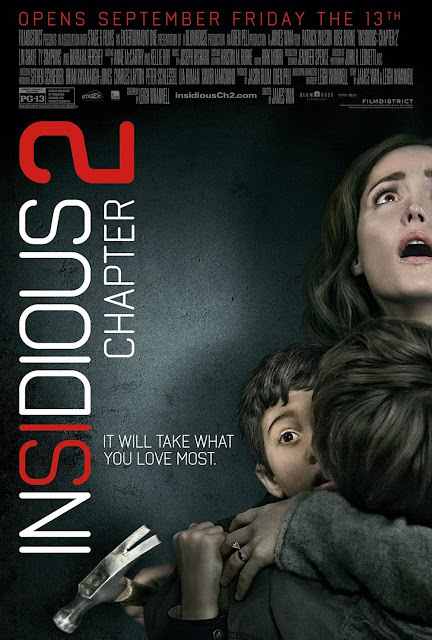 All of the stars of the original 2011 supernatural horror film "Insidious" appear in this sequel, "Insidious: Chapter 2": Patrick Wilson as Josh, Rose Byrne as Renai, Ty Simpkins as Dalton, Barbara Hershey as Lorraine. "Insidious: Chapter 2" basically is a continuation of where the previous film ended, with Renai wondering if it really is Josh who came home from "The Further." 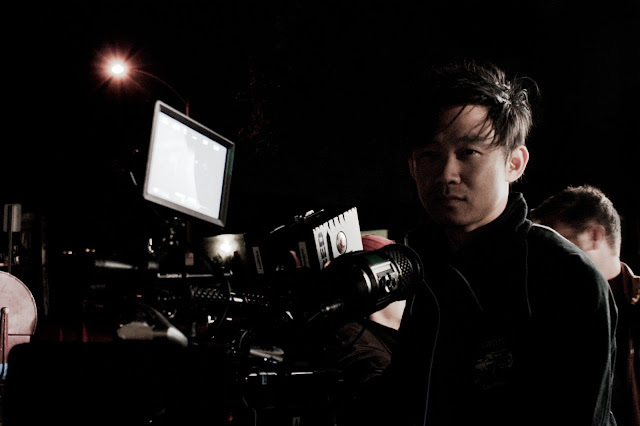 Director James Wan returns to provide a suspenseful answer to that question. If you've already seen "Insidious: Chapter 2," you may read my full review of it here. If you liked the original, you should enjoy this follow-up, which appears to have similar themes and explores the strange new world first encountered in "Insidious." Horror films are one of the most reliable staples of cinema. If you look back in film history, you see that horror has produced some of Hollywood's most memorable experiences and biggest stars. It is not a genre that gets much recognition by the industry, but recent horror masterpieces such as "Sinister" (2012) and "Insidious" (2011) from Stage 6 Films continue to find their audiences. Directed by James Wan and written by Leigh Whannell, "Insidious" features the Lamberts, a normal, happy and loving young family. Renai and Josh, along with their three children, have just moved into a new home. While looking through a family photo album with son Dalton, Renai explains to Dalton that there are no childhood pictures of his father, Josh, because Josh had been camera shy. Later, Dalton hears noises in the attic and goes to investigate. Climbing up, the ladder breaks and Dalton falls, but as he does so, he seems to see something odd. The next morning, Dalton does not wake up as normal, and it turns out that he is in a coma. Josh in his trance in "Insidious." Months later, Dalton is moved back home from the hospital. Renai then begins hearing strange noises and voices, and she sees a bloody hand-print on Dalton's bed. Youngest son Foster then strangely says that Dalton has been walking through the house at night, which is impossible since Dalton remains in a coma. When Renai investigates that night, a strange man assaults her. Terrified, Renai convinces Josh to move the family somewhere else. 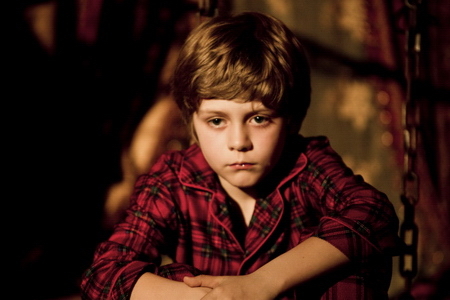 Ty Simpkins as Dalton in "Insidious." Nothing changes at their new home. The family sees things such a weird dancing boy, and Josh's mother, Lorraine, says that she had a dream about going into the comatose Dalton's bedroom at night, only to see someone standing there who said his name was Dalton. Dalton also winds up being attacked by a red-faced figure. Understandably concerned, Lorraine calls her friend, Elise Reiner, who specializes in investigating paranormal activity. After Elise arrives with her assistant, everybody gathers together and enters Dalton's bedroom. Elise claims that she sees a strange black figure with a red face on the ceiling of Dalton's bedroom. The description matches the figure that Lorraine had seen earlier. Elise tries to figure out what is going on, and concludes that Dalton is astral projecting while comatose. She surmises that Dalton has been doing this since he was very young, and that doing it too much is what caused him to fall into his coma. He travelled too far into the spiritual world and got lost in "The Further," the land of the dead. Dalton's spirit remains there, among the dead, while all that is left in this world is his body. Dalton's new dead companions know about his empty vessel of a body and wish to use it themselves, to live again. Some also want to use the body for nefarious purposes, to torment people in the living world. It is only a matter of time, according to Elise, before one of the demons from "The Further" succeed in occupying Dalton's body for good. 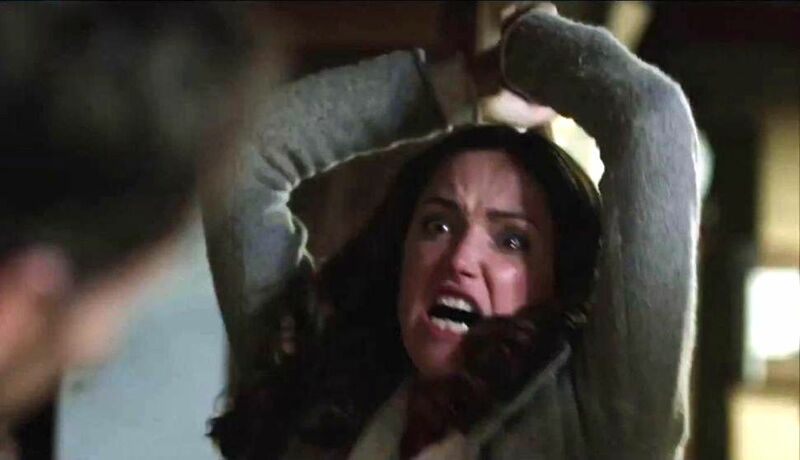 Rose Byrne as Renai in "Insidious." Elise's analysis is confirmed when Josh learns that Dalton had been drawing pictures which bear a strong resemblance to the red-faced figure seen by Lorraine and Elise. At a seance, they try to communicate with Dalton, but the red-faced demon possesses Dalton's body and interrupts. It turns out that Josh also can astral project and had experiences somewhat similar to those of Dalton when Josh was a boy. Looking at childhood photographs of Josh, they suddenly notice a strange old woman (who had been seen briefly at the beginning of the film) who acted in a menacing fashion towards him in the photographs. This explains Josh's childhood fear of being photographed. Elise with her assistant in "Insidious." Elise convinces Josh to use his ability to astral project in order to save Josh, Strapped in a chair and placed in a trance, Josh leaves his body and walks outside to search for Dalton. He encounters many strange people there, including a woman who shot a family and left them for dead in the Lamberts' original house. Going up to the attic of that house, Lambert fights off an attacker and, seeing a strange red door, proceeds through it. The red door opens up into "The Further," where the red-faced demon lives. Finding Dalton chained to the floor, Josh frees him. The demon attacks them, so Josh and Dalton flee, chased by the demon. On the way to find their bodies, Josh and Dalton also find and attack the old woman from Josh's childhood photographs, chasing her away. Barbara Hershey as Lorraine in "Insidious." Josh and Dalton then awaken, and Dalton finally is recovered from his coma. Everybody assumes that the problem is solved, but Elise senses that something is wrong. Taking a picture of Josh sends him into a rage, causing him to strangle Elise to death. Renai then investigates, but finds that everybody is gone. Looking in Elise's camera, Renai sees a new picture of the old woman, and she concludes that Josh has become possessed by the old woman. The film ends with Josh reappearing and simply telling Renai, "I'm right here." Dalton's room is the center of the proceedings in "Insidious." Everybody seems to like "Insidious," but calling it a classic is a bit much. It is a very enjoyable, low-budget horror film throwback that has all of the standard tropes of the genre: the family moving into the new house which has "secrets," people being possessed, the false ending which turns out to be not an ending at all, and so on and so forth. One-word titles are all the rage, and one wonders what will happen when they ultimately run out of appropriate words. If you've seen half a dozen horror films in your life, you will recognize many of the standard conventions being honored in "Insidious." The thing to remember about horror films, though, is that they are not good because they are original: they are good because they are executed well and have scary scenes and character that press some of our collective buttons. "Insidious" succeeds beyond all expectations on those scores. A new trend is horror is the involvement of photography and video. "Sinister," for instance, used that new theme to perfection. Everybody knows that women tend to enjoy reviewing old family photographs and video more than men, so the film craftily works that natural penchant into the storyline in a fairly subtle but very significant fashion. It is this kind of subversion of ordinary life that marks a truly creative new take on a tired old theme. 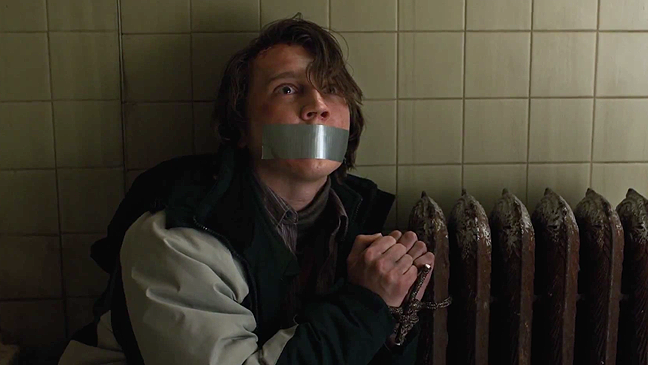 It is fairly obligatory these days to thrown in supernatural explanations for the strange events rather than just have it be some weird guy from the forest with too much time on his hands, so that twist also is incorporated in "Insidious." Things that go bump in the night in "Insidious." The direction and acting both are very competent. Director Wan projects suspense without gore, always the best way to the hearts of horror fans. To boil it down to its basic element, "Insidious" is a "spooky house" film where things go bump in the night and strange surprises beckon in every dark corner. It follows in the honorable tradition of classics such as "The Old Dark House" (1932), starring Charles Laughton, and well-known horror heir "Last House on the Left" (1972). A spooky moment in "Insidious." 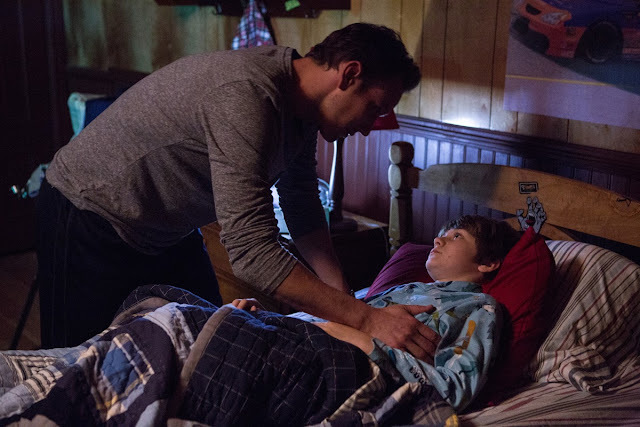 The "Insidious" leads, Patrick Wilson as Josh, Rose Byrne as Renai, Ty Simpkins as Dalton, and Lin Shaye as Elise, do what they have to do, and do it without too many unnecessary flourishes. Everyone is smart enough to realize that horror film fans don't go to see Academy Award-winning performances, but rather well-crafted situations which affect ordinary folks. Everybody in the cast delivers. That said, old pro (I hope she wouldn't mind me saying that) Barbara Hershey is a spooky stand-out as Lorraine, and her role was upgraded for the 2013 sequel, "Insidious: Chapter 2." Director James Wan working on "Insidious." Horror is no joke, especially at the box office. 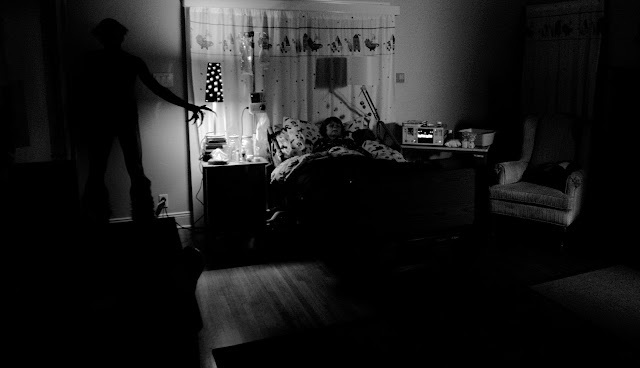 "Insidious" was the most profitable film of 2011, being made on a tiny budget but raking in $97 million worldwide. Naturally, a sequel was put in the works, and "Insidious: Chapter 2" opened in September 2013. The original "Insidious" is well worth the time of any horror-film fan, and the sequel, "Insidious: Chapter 2" came from the same team. 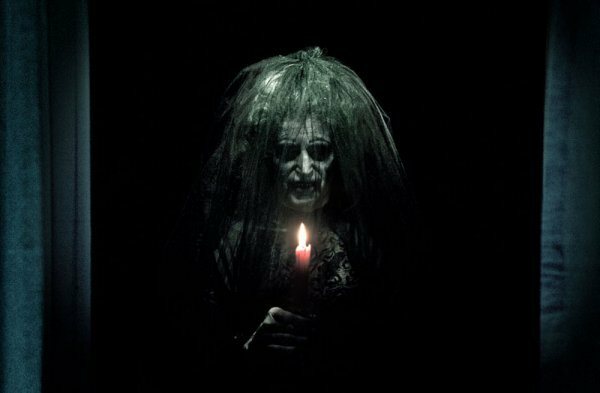 Below is the trailer from "Insidious."